There has been a sudden interest in this whole idea – before I got to wonder why – I read somewhere that BBMP has made rain water harvesting compulsory. I am glad I was able to attend this session on Rain Water Harvesting (RWH) by A R Shivakumar, Executive Secretary and Principal Investigator – RWH, Karnataka State Council for Science and Technology (KSCST). This was held at Mantri Classic Hall, ST Bed on May 15th. Around 30 people attended the session. It was a very good session and BWSSB is willing to conduct such sessions on request. All you need to do is go to your nearest BWSSB office and request for the same. I made an attempt to jot down a few points that interested me. 1) World Health Organisation (WHO) has the estimate of water required per capita as 135 litres but BWSSB is able to provide only 95 litres per capita. Shivakumar started the session by asking everyone to guess one’s water consumption. Shivakumar gave the example of milk alone. He said one litre of milk requires five litres of water during processing in a dairy. The plastic packing and transport were not even talked about. The cow that gives 1 litre of milk needs to be fed 35 litres of water. 1kg of sugar equals 2500 litres of water! 2) There used to be 262 lakes in Bangalore forming an excellent system with rain water pouring in the center and filling the lakes up. We now have only 82 left, mostly polluted or eaten up by weeds. See this video on one such lake. He said that one needn’t dishearten as all hope is not lost – Bangalore is a city with good rainfall pattern with an average touching around 1000mm. All we need to is harvest this rain water. He also said that we have fresh clean water coming from the skies and we just let it flow back into oceans within a few hours of the rain – much dirtier. With the concrete roads and little planning for seepage, the ground water tables will only suffer more. Ground water is a public property and people are misusing it, he added. A screenshot of KSCST’s slideshow on rain water harvesting. Credit: Karnataka State Council for Science and Technology (KSCST). 3) One of the best examples he gave was about – Sourabha. Since 1995 the entire house needs including potable water is met out of rainwater. 4) In rural areas people pay Rs 4 for one pot of water, while BWSSB brings water to your door step each day at Rs 6 for 1000 liters. The poor are paying much higher than the rich. The session was filled with such facts and I would recommend it be organised in all the places possible. At the end of the session, one gentleman stood up and told that their apartment should be exempted from this rule as it would not make much sense to harvest water in his apartment. The number of families can’t really be supported with the limited roof area and the setup would cost them Rs 4 lakhs. Shivakumar overruled his suggestion by asking him to do the water consumption calculation per family in apartments and compare it to an independent house. Individuals and institutions can contact Rainwater Harvesting Cell at Karnataka State Council for Science and Technology (KSCST) for technical advice, planning and project implementation. Check out this very impressive list with successful examples. You can see the slideshow on rain water harvesting here. We have a community created for the people in rain water harvesting in Bangalore. Please join the same for any discussions. With its exquisite carvings and magnificent stone work, the Somanathapura temple is a treat for the eyes. Pay a visit to step back in time. Street dogs typically feed on garbage. But here’s a couple that actually cooks food for 100+ strays. 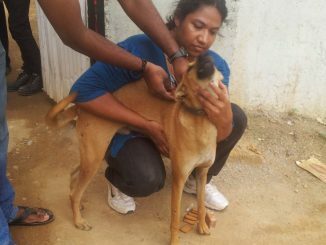 Bismi and Anil are the good samaritans of Whitefield whose work with strays, is awe-inspiring and inspirational. 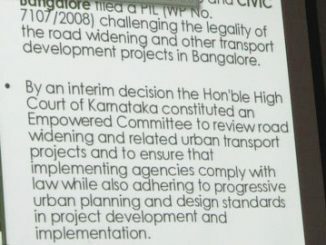 Two recent meeting between Hasiru-Usiru, a citizens group and the BBMP turned acrimonious. At heart is the rapid loss of the city’s trees and the involvement of citizens in decisions.